In 2015, more than one million migrants and refugees, most fleeing war-torn countries in Africa and the Middle East, attempted to make the perilous journey into Europe. Around three thousand lost their lives as they crossed the Mediterranean and Aegean in rickety boats provided by unscrupulous traffickers, including over seven hundred men, women, and children in a single day in April 2015. 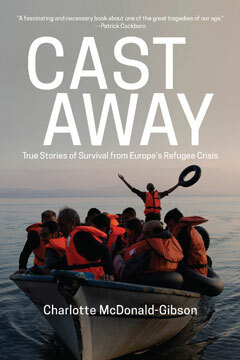 In one of the first works of narrative nonfiction on the ongoing refugee crisis and the civil war in Syria, Cast Away describes the agonizing stories and the impossible decisions that migrants have to make as they head toward what they believe is a better life: a pregnant Eritrean woman, four days overdue, chooses to board an obviously unsafe smuggler’s ship to Greece; a father, swimming from a sinking ship, has to decide whether to hold on to one child or let him go to save another. Veteran journalist Charlotte McDonald-Gibson offers a vivid glimpse of the pressures and hopes that drive individuals to risk their lives. Recalling the work of Katherine Boo and Caroline Moorehead, Cast Away brings to life the human consequences of one of the most urgent humanitarian issues of our time. O, the Oprah Magazine lists Cast Away as one of their "25 Books to Read This Fall"